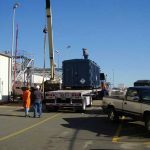 MRR was contracted to remove two underground 4000- and 5000-gallon odorant storage tanks and several above-ground smaller tanks. The odorant remaining in the tanks was filtered and transferred to another station for re-use using MRR’s bobtail truck. The project included the odorant transfer, the decommissioning of the tanks, excavation and backfilling. Afterward, the tanks were brought to Philippi, WV for thermo-chemical treatment, i.e. to decontaminate them from residual mercaptan. The tanks were then recycled for metal. In other cases with large underground odorant tanks, depending on environmental constraints, the client may opt to have MRR perform on-site treatment of the tanks, then fill them with an inert (e.g. sand) and abandon them. MRR hires and coordinates the work of local contractors for excavation, loading, etc, within the requirements of the gas company.